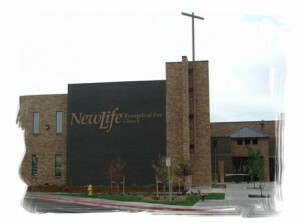 New Life Community Church in Aurora, Colorado, is an association of the Evangelical Free Church of America. At New Life, we believe an understanding of our name gives you an understanding of our beliefs. New Life – We believe that God sent His Son into the world to die for the sins of humanity and that through belief in Jesus Christ we may live a “new life” (Romans 6:4). This “new life” affects our lives, marriages, families, jobs, finances, hopes, dreams — everything! Community — We are a church that has been raised up by God to be a blessing to this community in which we live and minister — i.e. the East Denver Metro Area. We consider it a privilege to be a part of this community and to share Christ’s love and Good News with all who live here. Church – We are a local gathering of Christ’s universal church that has been raised up by Christ to be a lighthouse, first to the East Metro area of Denver, and ultimately to the world. While we know that we will never be a perfect church, we pray that you will find New Life to be a godly, loving and caring community of believers in which you and your family can come to know God and grow in your relationship with Him. As Jesus said in John 10:10, He not only wants us to experience eternal life in heaven one day, but an abundant life right here and right now on this earth. This will take place as we grow daily in our relationship with Him and with one another! Your generous donation will enable our church to continue to help others, just as God has called us to do.